This has been out for MAC users for quite a while and recently for Windows users. I have been using it for a couple of weeks and greenpois0n rc5.4 is definitely stable. For users that are new to jailbreaking, let me assure you that it is really quite simple as long as you follow the steps. There is the myth that you will void your warranty once you jailbreak. Let me tell you that I have exchange my iPhone 1 for 1 at my mobile shop without any issues. Simply connect your phone to iTunes and set it back to factory default and they will not know that you have jailbreak it. 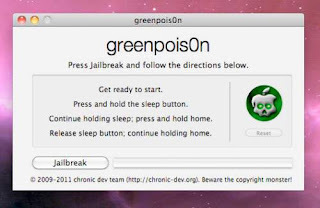 So for new users, this greenpois0n rc5.4 is a must have. Jailbreak your iphone/ipad and explore the true meaning of mobile computing! Get this before iOS 4.3 is out!! It will be out soon so upgrade now if you dont want to go thru the hassle of downgrading your version. Make sure to backup your applications first. Go to iTunes and sync all the applications. Also Right click on your iPhone and select "Transfer Purchases" to properly sync all applications. Only for the tech savvies! Connect USB cable to your computer. Click Jailbreak and follow the instructions. If you do not know the difference between sleep button and home button, throw your device into the bin or give it to me. :p Ok, sleep is the power button, home is the circle button with the square symbol. Once it is installing, jailbreaking your device, do NOT plug out or do anything. Just wait patiently for the device to reboot itself. Click that LOADER, click CYDIA and select Install Cydia. Now, wait till Cydia is installed and you should see the Cydia App Icon. Done, your device is jailbroken. Have fun! Installous is definitely one of the first few awesome stuff you want to install. Then download Installous 4 and in future, get your apps from Installous instead of app store - for free.